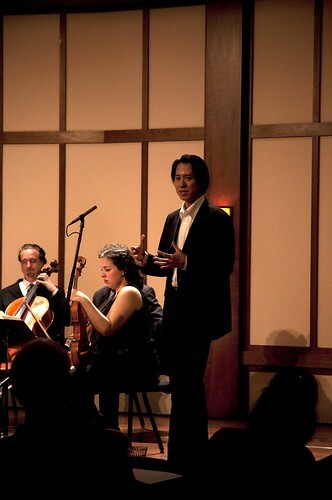 By means of numerous departures and arrivals over five days, David and Wu Han played multiple roles on stages from New York to Washington to California. 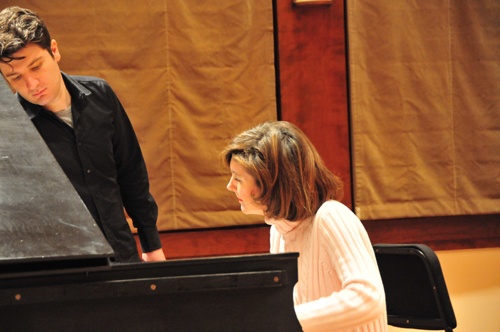 Beginning with the second program of the Chamber Music Society’s Late Night Rose series, activities featuring David and Wu Han together and as individuals allowed them to touch base with their myriad projects. 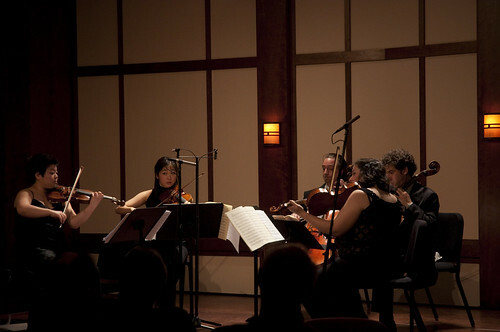 Patrick Castillo, in his new role as series host, journeyed in from Minnesota to introduce Britten’s Phantasy Quartet for Oboe and Strings (with oboist Stephen Taylor, violinist Kristin Lee, violist Beth Guterman and cellist Nicholas Canellakis). 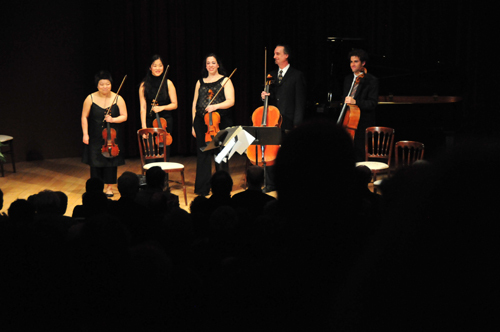 Following the Britten, I was joined by the strings from the Britten plus violinist Yura Lee for a performance of the Schubert Cello Quintet, which was streamed live by CMS to an audience of that included viewers across America and as far away as India, France, Australia and Singapore. 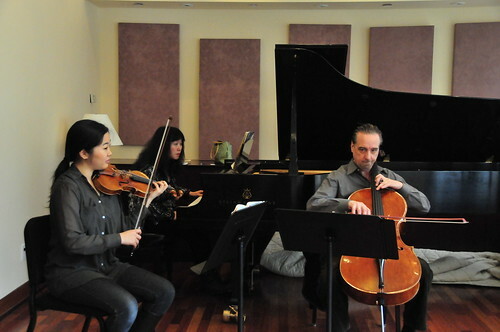 Friday morning found us in a rehearsal of Beethoven’s Archduke Trio, with violinist Kristin Lee, in the Society’s studios. 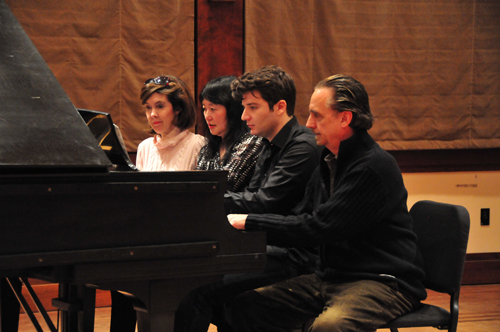 The afternoon’s rehearsals took place in the Rose Studio, where Wu Han was joined by pianists Anne-Marie McDermott and Alessio Bax to prepare for the second Music@Menlo Winter Series concert on Sunday. 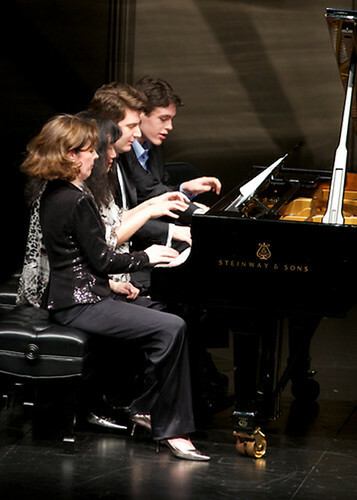 The program consisted of Rachmaninov’s Suites Nos. 1 and 2, plus Ravel’s La Valse for 2 pianos, and Debussy’s Nocturnes. 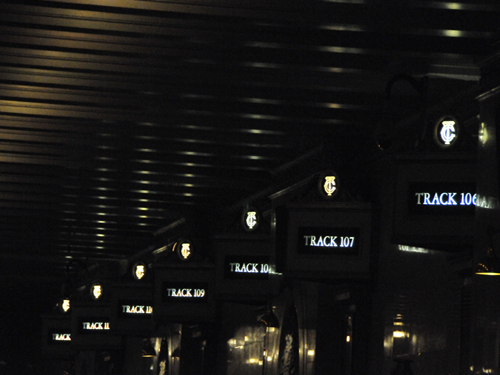 With music as dazzling as this, an encore had to be ready. Alessio Bax produced an entertaining piece for, unbelievably, eight hands on one keyboard by Albert Lavignac. 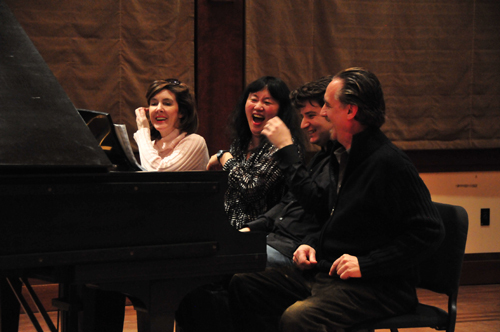 As the only extra pianist around, I had the honor of sitting in for the rehearsal, much to the amusement of my esteemed colleagues. 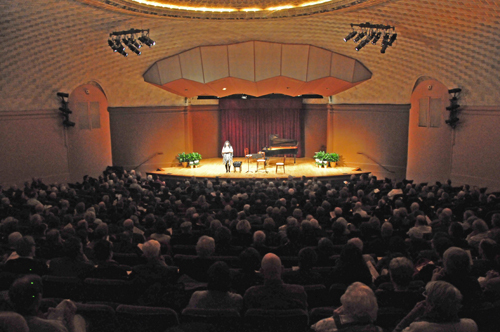 Once every season, a single member of the Emerson Quartet performs a solo concert on the Emerson’s series at the Smithsonian Institution, where we have appeared annually since the early 1980’s. As this year was my turn, I suggested to Wu Han that not only she join me but that we use the opportunity to show off some of our stellar young players from CMS. We were delighted to find a capacity audience awaiting us in the Natural History Museums’ Baird Auditorium, which, if you know the museum, is directly beneath the elephant. 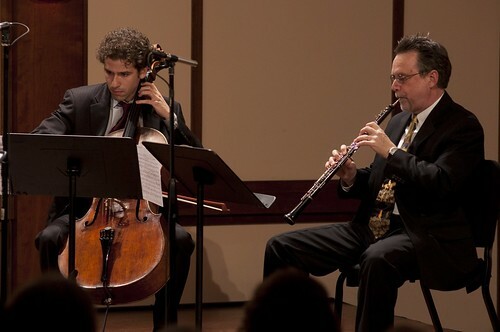 The concert began with a performance of Schubert’s single string trio movement. Our colleagues introduced each work from the stage. 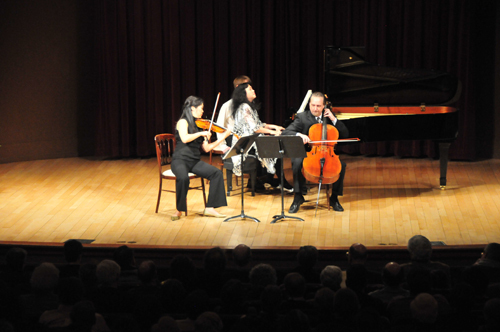 Following the Schubert, Wu Han and I were joined by Kristin Lee for a performance of Beethoven’s Archduke Trio. The concert concluded with the magisterial Schubert Quintet, performed by the same cast who had excelled in the Rose Studio performances two nights prior. The audience – which rarely hears collaborative works on this series – could not have been more demonstrative, responding with an instant standing ovation which called us back many times to the stage. A long drive back to New York awaited me, Kristin and Nick; however, Yura and Wu Han headed by taxi for Dulles Airport, where Yura flew to Boston to catch a night at home before departing for concerts in Germany on Sunday. Wu Han, on the other hand, flew all the way to San Francisco to be there for the next day’s Music@Menlo Winter Series concert. 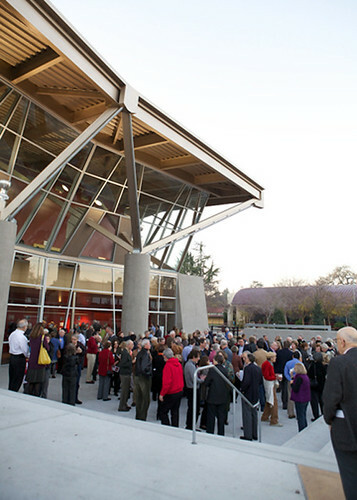 The 2010-11 concert season witnessed a major addition to our artistic responsibilities: a winter series connected to our summer festival, Music@Menlo (see blog post October 5, 2010). This, the second concert of the series (completely sold out) was titled Pianos/Pianists and featured Wu Han, Alessio Bax (who just last summer made his stunning festival debut) and Anne-Marie McDermott, who we hope will join us for a festival sometime soon. The trio of pianists, in various combinations, performed the works they had rehearsed last week by Rachmaninov, Ravel and Debussy. 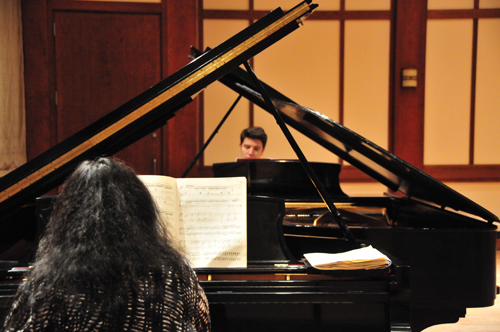 For the Lavignac encore, they were joined by former Music@Menlo Chamber Music Institute artist Peter Asimov, now a highly accomplished professional pianist at Brown University. 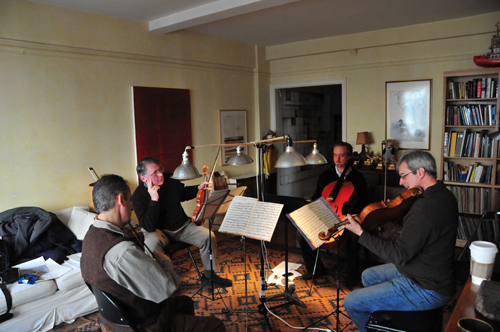 While Wu Han stayed in San Francisco Monday to work with the Festival staff, I rejoined my colleagues in the Emerson Quartet for an intense day of rehearsal in preparation for a series of highly-demanding recording sessions beginning Thursday. Stay tuned for details of the Emerson’s latest recording venture and exciting news of our recording plans.